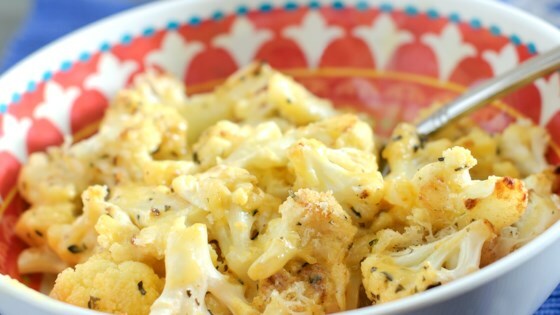 "This low-carb keto cauliflower mac 'n cheese is a wonderful alternative to the traditional version, and a great vegetarian main dish as well." Arrange cauliflower on the prepared baking sheet. Sprinkle with salt, mixed herbs, and pepper. Drizzle with olive oil; toss until well coated. Roast in the preheated oven until crisp, 10 to 15 minutes. Place in an 8-inch baking dish. Combine Cheddar cheese, heavy cream, ghee, and nutmeg in a saucepan over medium heat; simmer until bubbly, about 5 minutes. Pour over cauliflower; mix well. Sprinkle Parmesan cheese on top. Bake in the preheated oven until golden, about 10 minutes. Get a head start on busy weeknight Mac & Cheese! Will definitely be making this again. We loved it!! This was ok. Was hoping for a creamier cheese sauce. This sauce was a bit oily with cheddar cheese, so I might try a different kind next time. Accidentally hit review on this recipe. Have not made this exact recipe yet but can't remove review. This was easy to fix and a hit with the whole family, including a picky teen. Will definitely make again.